We’ve just turned on a brand new accounts page for all VaultPress customers. Previously, you had to email us to change your credit card information, request a receipt, upgrade your plan, and so on. Now you can manage your VaultPress account directly from the Account page, accessible at the top right of your VaultPress dashboard. Change your credit card details. If you need to enter a different credit card, or update the information for your current card, you can do that here. View/print receipts. Many of our customers need receipts for documentation reasons at their companies. Modify your plan. You can easily switch between our Basic and Premium plans. View next billing date. Confirm the next billing date for your subscription. View all accounts. 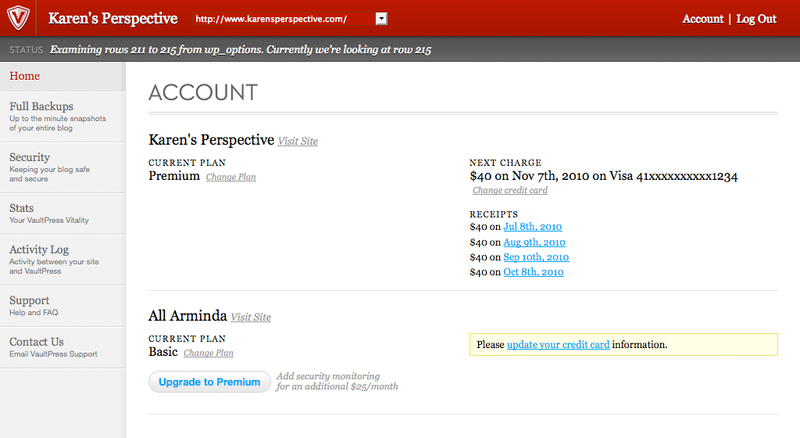 If you manage multiple VaultPress secured sites, you can view all your account info for each of your sites here. The new accounts page is live for all customers now. Let us know how you like it, and what else you’d like to see us add to it, in the comments below. @farmstandapp co-founder, @studioboro co-founder, compulsive traveler, lover of healthy living. I'm making things I love. This entry was posted in Announcements, Features and tagged accounts, VaultPress. Bookmark the permalink.